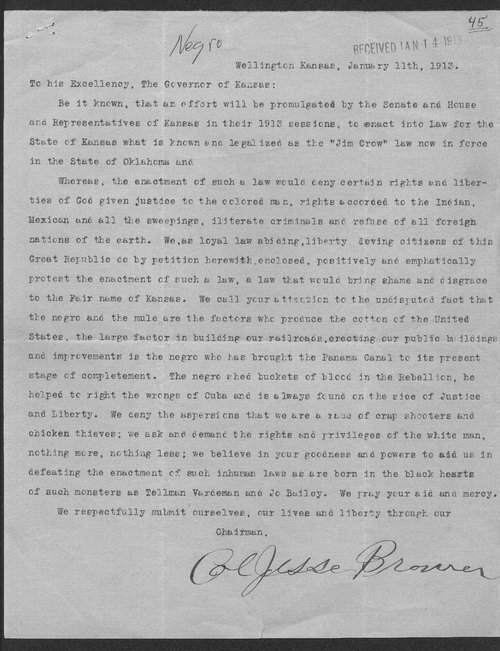 This letter was submitted by Jesse Brower on behalf of the citizens of Wellington, Kansas, to Kansas Governor George Hodges concerning the possible passage of a Jim Crow law in Kansas. Brower explained how Jim Crow laws denied black people their basic rights as citizens. The letter goes on to remind Governor Hodges that African Americans had always been loyal, law abiding citizens. He argues that forcing them to live under the rules of Jim Crow would have been shameful and embarrassing. Jim Crow laws were in place in almost all fifty states during this time, especially in the South. Although this particular law failed to pass in Kansas, it would take another fifty-five to sixty years for such laws to be overturned nationwide. The term "Jim Crow" referred to a caricature of a black man in a popular minstrel song of the same name during the late nineteenth century.